Variscite is pleased to announce a significant partnership with Grossenbacher Systeme AG, a Swiss Electronic Engineering & Manufacturing Services (EEMS) specialist, focusing on industrial embedded systems such as control systems, display systems, and medical electronics. The main goal of this partnership is to harness the advantages of the System on Module technology and to provide complete system support for companies who develop ARM-based devices; from the early concept stage, through custom hardware and software design, up to successful mass production. Variscite is expanding its business activity in the DACH market (Germany, Switzerland and Austria) by establishing a local subsidiary in Germany, Variscite GmbH and upgrading its website and other marketing assets to support the local needs. The partnership with Grossenbacher Systeme AG is an additional step in the overall course of the company in the DACH region. Grossenbacher Systeme AG’s customers in the embedded solutions, controllers and display systems markets will benefit from accelerated hardware development of their own system around Variscite SoM solutions which will further shorten time-to-market and lower overall system development costs and risks, while benefit from local support for the entire process of system design and integration of their customized platform. “We are pleased to take the partnership with Variscite to the next level, especially since we have already carried out many successful projects based on Variscite’s products and brought them to mass production. In addition, we have a positive common history with Variscite GmbH management. Therefore, we believe in the potential of this partnership”, says Oliver Roth, Managing Director of Grossenbacher Systeme AG. Markus Steidl, Managing Director Sales and Marketing of Variscite GmbH, adds: “Along with the opening of our new Variscite GmbH subsidiary in Germany, the cooperation with Grossenbacher is yet another step in building our local presence and ecosystem in the DACH region, aiming to provide Variscite’s customers the best system solution around our leading SoM products”. 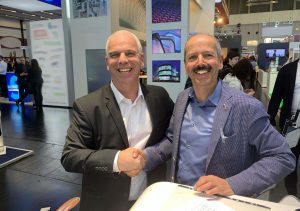 Ofer Austerlitz, VP Business Development and Sales at Variscite (left), and Felix Niederer, Managing Director at Grossenbacher Systeme (right) signing the cooperation agreement at Embedded World 2019.